Starting from the 1st century BCE, the area of the Garda, including what is now Sirmione, became a favourite resort for rich families coming from Verona, then the main Roman city in north-eastern Italy. The poet Catullus praised the beauties of the city and spoke of a villa he had in the area. The main historical landmark of Sirmione is Grotte di Catullo, the most striking example of a Roman private edifice discovered in northern Italy. The edifice had a rectangular plan and measured 167 x 105 m. The town is famous for its thermal springs too. Follow my roat trip pictures on Instagram @ReinventYourself I have lot of more places to share with you. Have fun in continuare ! What a magically beautiful place! Those photographs are adorable! I love your trip and I follow you to see where will be the next stop. Gorgeous pictures :) I love your bag! I wish you a very lovely trip. Have lots of fun and enjoy. Beautiful pictures and great bag! me want more trips and visits to wonderful places. amazing photos!and i love your vacation look! Estou impressionada, que lugar lindo! As fotos ficaram lindas! E' un posto stupendo, le foto sono bellissime! Un bacio! that's what I call a special place! Superb loc, ruinele.. apa.. si pozele au o lumina speciala! Wat een prachtige plek! En je ziet er ook erg mooi uit, prachtig bloesje! 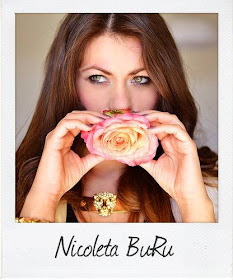 Nice photos, Nicoleta! I like your bracelets! :) If you’re looking to get inspired about the jewelry you could wear, then I’ll be waiting you on my blog: http://jewelryloveaffair.blogspot.ro/. Great look and amazing nature!